CIIA has over twenty online training courses, for member shops that work out to less than $3.00 each. Included in the courses are Bill 168 Violence in the Workplace training, Hoist safety and Isocyanate training. Dear Association member (and those that should be members): On July 10, 2012, the Standing Committee on Finance and Economic Affairs, a Committee representing all three MPP parties in Ontario, met in Brampton and requested a presentation from your association. I am including the presentation below and urge everyone to read it. The impact of this presentation was immediate with an number of MPPs in all parties, including government asking for further meetings. The presentation highlights how the collision repair industry is being abused and underfunded, particularly by insurers, leading to an inability to retain professional staff and obtain necessary equipment needed to properly repair a modern vehicle. It highlights insurance parts-procurement progams and fees paid by parts companies to insurers and how shops may only buy parts from suppliers that pay the insurer a fee. Your feedback would be appreciated. The Chair (Mr. Bob Delaney): Our first deputation of the afternoon is going to be the Collision Industry Information Assistance. John Norris, if you’re present, come on up and start us off. Pick any chair; they’re all the same. Make yourself comfortable. You’ll have 15 minutes to present your thoughts and opinions, followed by up to 10 minutes of questioning. The rotation will begin this time with the government side. Please begin by identifying yourself for Hansard and then proceed. Mr. John Norris: Mr. Chairman, thank you very much. Good afternoon, members of the committee. My name is John Norris. 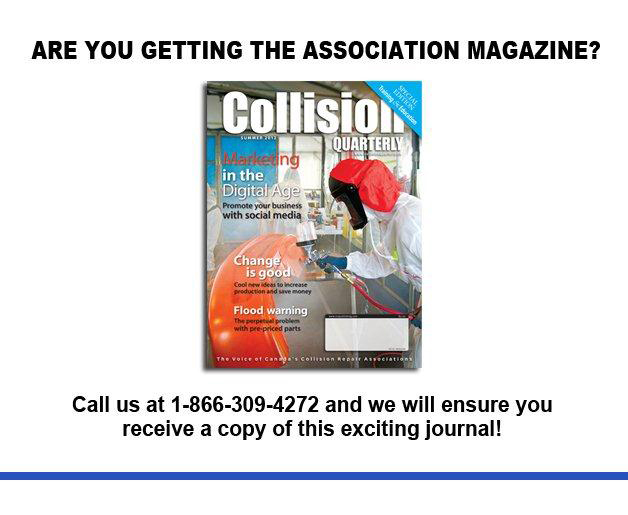 I’m the executive director for the collision repair trade association in Ontario, and have been since 1988. I should tell you a little interesting story. Just as I was leaving my office this morning for this meeting, I had a call from a shop in Toronto, and they had a customer in there with a collision repair being towed there. They were very upset. So they prep the customer and off they go, long before the police arrive. That type of solicitation at accident scenes, whether it’s for tow or whether it’s for clinical assessment or rehabilitation, is happening every day, every hour, all over the province of Ontario. I am one of the contractors that helped design the Ontario Ministry of Transportation’s stolen and salvage inspection program for shops in Ontario. We have over 500 collision repair shops that are inspection stations that are inspecting rebuilt vehicles to ensure their safety and legitimacy—i.e. they are not stolen—going on the roads of Ontario. I’m also the administrator for the Vehicle Security Professional Program in Canada this year. It just started in Canada after four years in the US, on behalf of the 18 car companies in Canada that import and manufacture in this country, and the after-market technicians. That program provides security data from the manufacturers directly to a qualified tech to fix the car. Why am I mentioning that here? Because those security data include CAT, collision avoidance technology. As we have more and more vehicles in the system and being able to repair more vehicles, it’s not a surprise to anyone in this room to see the Volvo S60 commercials of the car stopping itself before it hits something; the Lexus SUV that stops itself before you actually back over something in the driveway; the new Cadillac SVT programs, where the car’s steering wheel shakes to warn the driver they’re getting too close to another vehicle. If this program is successful, our US program identifies through NHTSA that in 25 years we’ll have an 81% decrease in motor vehicle accidents, and we’ll hopefully have a similar decrease in the amount of problems that you have on the insurance claims side and the problems you have on the health care side. So there’s a light at the end of the tunnel. The technology may solve us all a lot of problems and a lot of headaches in the future. In the interest of full disclosure, I should tell you that when I was a teenager and I saved for my first dream car—it was a used sports car—I had my first insurance experience. My used sports car was appreciating, not depreciating, in value, so I asked my insurer about it. I was told to see an appraisal firm that he recommended and obtain an appraisal. I did that. The appraisal showed the car had increased in value. I paid for the appraisal and the insurer’s invoice for the additional premiums that my insurer required to cover the new replacement price. Sure enough, the car got stolen. After 30 days with no recovery, I asked the insurer for the money they had appraised the car for and I had paid additional premiums for. The answer: “Not a chance,” said the insurer. They’ll pay only what they think is fair, and their idea of fair was significantly below the appraisal price they had previous accepted. Did I want to complain? Sure, I did. I was told, “You either take the lower amount cheque now, Mr. Norris, or we’ll see you in three to four years in court.” So I took the cheque. That was my first experience as a kid in the auto insurance business. However, with 300 members in our association, we hear and live with the complaints from our members, that I want to highlight to you today, that show the level of abuse that takes place immediately after that physical collision on the road, abuse that costs us all millions of dollars a year and can often be used to justify higher premiums for motorists. Please remember that in all the discussions you’ve heard of treatment plans and bodily injury claim costs, it’s the collision repair shops who are the first to see the car and often the customer. We can tell if the vehicle was damaged now or earlier. We can tell if an accident may not have happened or had been staged. We know if the tow operator tried to sell the collision. We know if the tow operator obtained personal and private customer information so they could sell that information to a treatment clinic. These are professional, Ontario-licensed, trained techs who can spot a fraud when they see it. As an industry, we can be the first line of defence against fraudulent claims. Yet we’re never mentioned in the FSCO report. We were never asked to help with the Ministry of Finance report on auto insurance abuse. We were ignored. We’re disappointed that, with our wide range of grassroots and repair knowledge, and our past work with IBC on towing abuse and with the province on theft claim issues, we were left out of that discussion. Every day we hear from our members the tales of kickbacks, payoffs, towing abuse, medical treatment clinic sales techniques and aggressiveness, all while trying to calm down and protect that poor car owner, who soon will be exposed to the high-pressure sales tactics used on today’s accident victim. And we wonder why premiums are high. Well, more importantly, I will highlight the options for you today that are already available to the government to handle this and stop much of that costly abuse. I can tell you, in collision repair in Ontario, the average insurance cost for a car repair was lower in December 2011 than it was in December 2004. I can guarantee you that clinics and medical costs are up 300% or more while our costs have actually gone down. Shops tell us of abuse details, of tow truck operators selling collision work for a kickback and selling private, personal information of the car accident victim to get their $2,000 commission from the treatment clinic all the way to demands for kickbacks that shops must pay to keep repair work in their shop. Even the parts companies that supply the parts to repair your accident collision damage must pay in kickbacks. “Kickbacks” is not a nice word. Many will appear before you after my presentation today to contradict me and explain that they’re really just business transactions in cash; they’re really just referral fees for business; they’re really discounts, or offered freely in order to obtain a thank you for business volume. For the next few minutes, let’s just call those new definitions on an old game what they are and just talk about kickbacks—some in cash, some under a contract, many because of the fear of what will happen to their future business if the kickback isn’t paid. Those business threats are rarely entailing violence, although I had death threats when we were working with Toronto licensing to clean up an endemic towing overcharge problem. By the way, we solved that problem and saved the insurance companies in Toronto alone $8 million each year on their towing bills. Usually the threats are to blacklist your business. Usually the threats are that no cars will ever be towed to your shop, or every effort possible will be made to steer customers away from your business. I’ll tell you today that there are none of our shop members here with me. I’m here alone. Not a single shop owner would come with me today because they’re too scared to appear with you and be seen in public. They believe that any testimony or presentation to you today on what actually happens after a car accident—what they go through, what they see every day—would be used to shut down and isolate their businesses to the point of business failure, and they simply cannot afford to be blacklisted. So let’s have a quick look at what goes on with kickbacks and why it costs so much money to the insurers in the claims process. There are treatment clinics that issue commissions of $2,000 to tow drivers who will transfer private, confidential data on accident victims to them. We interviewed a tow driver who makes two calls a week and he gets $125,000 a year. All the rest of that is kickbacks. The clinic then immediately contacts the accident victims. They advise them that they are an insurance-preferred supplier or an insurance industry provider. Then they’ll set up an expensive treatment plan. They haven’t met the victim yet. There are tow truck drivers and operators who push for their kickback as they sell the collision-damaged car to a body shop. Those repairs across Ontario now cost the shop, because the shop now seeks to recover the extra dollars paid to the tow operator. Our association receives calls from homeowners living behind a mall: “Why is a tow truck bashing a car into the wall at the back of the mall parking lot?” Well, by raising the damage level, the repair becomes more costly for the insurer and the tow operator gets a percentage of the damage appraisal. In order for a shop to generate the extra revenue to pay back that chaser, the insurer gets billed for work that wasn’t done; repairs with used or stolen parts that were billed as new; outrageous bills for storage; environmental fees; drop-offs; moving fee; $300 to move the car on the lot; $500 for a piece of cardboard under the vehicle to catch any oil drips; $35 to allow the customer one phone call. If the customer decides to take the car somewhere else for repair: days of frustration, thousands of dollars having to be paid in release fees because that kickback has to be paid somehow. Car repair costs have remained consistent for the last eight years, despite rapid increases in labour costs, facilities management, equipment, more costly supplies, and, frankly, shops are not in a position to pay any more of a fair wage. Insurers insist on sometimes using untested after-market parts that the car manufacturers recommend against using and may not respond the same as automakers’ original equipment parts in any new collision after repair in order to lower the price insurers pay out for an accident. These accidents may come back to haunt us in the form of increased injury after a second accident. This only delays the inevitable when these new accidents occur after the initial repair and the car occupant is badly injured with a huge claims injury cost because of a faulty repair, having used parts stipulated by the insurer but not recommended by the carmaker. New high-tech and safety-biased parts needed to repair newer cars are being refused for replacement with demands by insurers that after-market or cheaper, used parts be put on. Members, the kickbacks are on both sides of the table. Kickbacks are demanded by insurers, who often have a huge marketplace dominance and make decisions that determine whether your shop is going to survive or not for up to 10% of the price of the repair as a commission charged to send them their own customers’ business. This is after paying them a labour hourly rate that’s not sustainable to pay for equipment or new technologies. We are not aware that this kickback is being reported to FSCO. This is a business kickback that may not have been identified in the figures supplied to FSCO as claims revenue. It may be money that’s being kept by the insurer that’s used for other purposes. Similarly, if a kickback is received by the insurer for a repair that was through a no-fault system billed internally to the insurer that covered the at-fault driver, we worry the bill will be charged for the full retail amount and not the actual amount the insurer paid. This may mean higher insurance premium levels are being based on artificially higher claims costs than what actually happens. We also worry about what happens in a dominant marketplace because it means insurers, not competent repair shops, are ordering repair parts now for your car—often not the parts recommended by the car company, and from vendors the shop doesn’t know or are even close to the repair shop. When these parts are dropped to the shop by the insurer, the insurance company demands a 3% kickback from the parts company. Insurers demand that parts be ordered based on a list of suppliers given to the repair shop. No longer can the repair shop deal with suppliers they built up a long-standing relationship with, but they must deal, instead, only with the supply firms that provide a kickback to the insurer. We’ve asked the Competition Bureau to have a look. We’re worried that this is going to lead to higher injury costs in the future and that our shops might be responsible or deemed responsible. The Chair (Mr. Bob Delaney): It’s almost disappointing for me to inform you that you’ve only about a minute to go. Mr. John Norris: Let me just do a few highlights and a summary, if that’s fine, Mr. Chairman? Mr. John Norris: Why are insurance companies paying for collision repairs in the back of an oil-lube shop, to the point where the repair paid for those unlicensed, non-equipped open bays is so bad, the insurer must buy back the repaired vehicle and scrap it? We’ve seen cheques for $12,000, $48,000, $65,000 to buy back vehicles that have been repaired so badly with insurance money at illegal and underground garages that no car can safely be driven; they’re scrapped after being repaired. The easiest way to solve abuse, ladies and gentlemen, is don’t pay for it. The summary is that one option available—and it would be a rather surprising option, perhaps, that would have a huge impact immediately reducing insurance premiums—is to reduce the customers’ insurance premiums by the amount the insurance company received in kickbacks on his repair. How’s that for different? The Chair (Mr. Bob Delaney): And on that note, I’m going to have to ask that the questioning begin with the government side. Ms. Piruzza. Mrs. Teresa Piruzza: Thank you very much, and thank you so much for coming in and presenting to us quite a bit of information there. Unfortunately, we weren’t able to get through it all. Would you be able to provide us with the written copy? You have them there. Perfect. Okay. We can read through that. Now just with respect to some of the comments that you’ve made as well, because I remember some time ago—I’m going back a number of years now—there was quite an outcry in the industry with respect to preferred auto shops and insurance companies telling people, “No, you must go to this.” I recall there was quite a consumer education awareness process that we went through. I’m going back probably about 15 years now with that. Is that coming back in terms of having the preferred auto shops or is it better than it was years ago? Mr. John Norris: That’s a very good question. It started in 1991 with the demand of Allstate Insurance for a 10% kickback on parts sold. Preferred programs are institutionalized across Ontario; they’re not going to change. The intent of the preferred program was to protect the customer. So a customer who didn’t know whether they were going to be treated fairly, honestly, legitimately with qualified people would have an idea of where to go. In itself, that’s a valid representation. The insurance industry would then, using those types of standards of compliance, training and equipment, determine which shops could be on that list and be able to offer those to the customer. What’s happened, unfortunately, is that it has modified and now, because of the number of vehicles—if you recall, we didn’t get a winter and our shops were wondering if they could even survive that. But we have so little cars coming in now and will in the next little while—for as long as we can see, certainly, we’ll have less vehicles. What’s happening is the insurance company wants to drop the number of facilities. So they dropped the number of facilities—one company will go from 400 preferred shops to 150. We have one shop the other day that got notified by an insurer they’d been with for 20 years that they were leaving tomorrow—30% of their business would disappear; he’d have 30% less business. It was going to a shop down the road that offered them a 5% cheaper price. That shop did not have a licensed tech or any equipment to fix the car, but they still got the work from the insurer. Mrs. Teresa Piruzza: In terms of some of the elements or some of the issues that you brought forward in your presentation as well, do you have recommendations in terms of how to enforce? Because I think in a number of those elements that you brought forward there is currently legislation to prevent it from happening. But how does one enforce that? Secondarily to that as well, are those individual cases reported? The Chair (Mr. Bob Delaney): And on that note, I have to move the rotation. Mr. Yurek. Mr. Jeff Yurek: Thank you. Thanks for coming in today. Just further to that question, have you ever taken the fraud cases to FSCO? Mr. John Norris: We had groups take it to FSCO. In fact, those comments I made were to a government agency that took it to FSCO. We provided the data to them and they took it to them. Mr. John Norris: Oh, to FSCO? I’m sorry, no. That was a government agency that took it to the insurers. The only time we’ve met with FSCO was in regard to setting up a standard for what should be the level of shop payment—in other words, only legitimate facilities should be getting paid, not backyard oil-lube shops underground. That’s the only discussion we’ve had with them. Mr. Jeff Yurek: They’ve never offered to say, “Bring us your fraudulent claims. We can actually deal with it”? Mr. John Norris: No. We’ve asked to help them with their current auto insurance fraud issues, and we haven’t heard any comment back. Mr. Jeff Yurek: Nothing on that. Do you know what per cent cost to the total claims cost in the insurance business right now is due to the fraud part of your collisions schemes? Mr. John Norris: That’s a difficult—and IBC has the same problem in determining a number. They use a number of $2 billion and have for I think four years now on a consistent basis. So it’ s very difficult to say. It’s certainly in excess of $100,000 a day. Mr. Jeff Yurek: And finally, is there anything else from your deputation that you didn’t say that you’d like to add? Mr. John Norris: We did have a process set up—in fact, we presented it to Queen’s Park in 2001—to set standards for facilities. Those things can still work. I think the real, simple, easy things right now—I’m just floored that insurance companies seem to have no qualms with just issuing a cheque for no reason whatsoever to a facility that doesn’t exist. Mr. Ted Chudleigh: If I might, a short question: The premiums in the personal automobile business are about $10 billion a year. You suggested that they’re using a number of $2 billion a year; that’s 20%. So 20% of the insurance business is fraud? Do you find that number acceptable—not acceptable; I’m sure you don’t find it acceptable—but in the realm of reasonable? Is that something that you would think is reasonable? Is that how big this fraud in this industry is, 20% of $10 billion? Mr. John Norris: I think it’s not unreasonable to suggest 20%. We used to think that only 15% of the people in Ontario drove without car insurance, and now we find out it’s significantly higher than that. I think we’re looking at a significant fraud issue. I think all you need to do is go into heavy urban centres, have an accident and watch who shows up. That will tell you right away that there’s so much money in this that the tow-chasers are there trying to get to your car; they’ll fight. We just had one shot in Mississauga at an accident right in the middle of the intersection. Mr. Ted Chudleigh: There was one shot in Milton about three years ago. Mr. John Norris: It’s a very aggressive, cash-rich business, and they’re in it for the dollars. They’re not in it for the consumer, they’re not in it for the motorists; they are there to take as much money out of the insurance industry as they can. Mr. Ted Chudleigh: Thanks for coming in. The Chair (Mr. Bob Delaney): Thank you. Mr. Singh. Mr. Jagmeet Singh: Thank you very much, Mr. Norris. You’ve shed a lot of light on an issue here. I just want to ask you— I think a lot of times when we look at the fraud equation, a lot of the blame seems to be put on to the citizens of Ontario or the people in the communities. From what you’re recounting, and I think it’s more to what the anti-fraud task force is saying, organized crime and these types of fraud rings are the true culprits. At the same time, what you’ve touched on, which I think is very important, is that the insurance companies themselves have a large part to play in this. In simply ignoring the situation that they can easily take some steps on their own, or by ignoring people approaching them with valid claims, the insurance companies themselves are also a part of the puzzle. If you could just touch on that, what we could do to ensure that the insurance companies themselves who provide the resources, who are the source of the billions of dollars—how they can be monitored and there can be some oversight on the way they conduct their business. I will tell you that the easiest way to stop fraud is simply don’t pay it. As soon as you stop issuing that cheque to an illegitimate facility, as soon as you stop issuing that $2,000 commission cheque from the treatment centre, as soon as you stop issuing the kickback that either an insurer is getting or the tower is getting for selling that car, then you start to have an impact in the marketplace. You can do that through the Insurance Act, through deceptive practices; you can do that through towing regulations with municipalities; you can do it with police licensing programs with tow trucks; you can do it through audit programs where you have to identify where those monies are coming from. There are a variety of ways to do it. From the insurance side, I’m not convinced that insurance companies—and I’m sure someone is going to write me up in the media—are serious about the fraud issues. I’m convinced that they’re serious about getting their 12.5% return, but I’m not convinced that they’re serious on fighting the fraud issues—because they’re going to get paid for this one way or another. They’re going to get their money back without having to investigate those fraud issues. Mr. Jagmeet Singh: So what you’re saying is that in large part, insurance companies themselves are turning a blind eye to this when they should be playing an active role in preventing a lot of the waste that’s going on. Mr. Jagmeet Singh: My colleague has a quick question. The Chair (Mr. Bob Delaney): Mr. Norris, I am so sorry. I have to pull the plug on this one. On behalf of all of the members here, I’d like to thank you for having come in today and delivering what I guess I could describe, in an understated fashion, as a breathtaking presentation. We greatly appreciate your time and the insight that you have provided. Thank you again. Mr. John Norris: Thank you, members of the committee. After waiting for Ontario’s Apprenticeship Branch to provide accurate autobody and collision damage repairer data for many years, your association was finally able to obtain the data through direct intervention at the College of Trades. What the data shows (and the entire report is available at http://www.ciia.com/provinces/ontario/employment.html, is that the number of new entries into the trade since 2007 is relatively steady, while the number of graduates also remains the same at around 20% of those that were registered. A poor final result in apprenticeship is an immediate cause for concern, as it shows that there are serious problems within the system and with employers that need to be rectified. Only 2 out of every 10 new excited, interested apprentices ever make it to being a tradesperson. At the same time, the report highlights that “challengers” – those who have accumulated the time working illegally in the trade and then are allowed to sit the final exam, represent almost as many finalists as those going through standard apprenticeship. As well, the report shows that almost 1000 autobody and collision repair apprentices are still on the books in Ontario, but not in the formal system. So where are they? In 2009, the two new car associations signed an agreement (the Canadian Automotive Service Information Standard or CASIS) with the aftermarket associations to voluntarily disclose the service, training and equipment information that some of the car manufacturers were only allowing their new car dealers to access. Now the aftermarket (that’s your shop) has the ability to work on any car or light truck in the same way the dealer can by just accessing the OEM’s web site. In 2011, the portion of the agreement related to security information was approved by the car maker associations and will be ready for use in mid-2012. This is called the Vehicle Security Professional (VSP) program and will allow any approved technician to access security codes and key or immobilizer information from most of the OEM’s web sites, after clearing a criminal record check and working on behalf of a customer. In the first three months of 2012, between the Vehicle Security Professional program in Canada and the similar program, Secure Data Release Model in the United States, we have processed over 96,000 security transactions. When the security information requests at six on the OEM manufacturers at the dealership level are added, the total number of transactions rises to over 521,000 in three months. For Canadian vehicle service and repair facilities, this is a solid indicator of the volume of business that is being conducted and up until now could not be conducted in Canada. Applicants wishing to be registered as Vehicle Security Professionals in Canada, must complete a detailed application form and agree to criminal record and background check, prior to being issued a VSP passcode. With that passcode, this automotive technician or locksmith, can then access security related data on the OEM web site for most cars as long as the owner has authorized the repair. This transaction is handled in the same fashion as a credit card transaction and 97% of all transactions are completed within 3 seconds. The current Vehicle Security Professional web site is accessed by invitation only at this time and is expected to be at its new home at www.vehiclesecurityprofessional.ca soon. A marketing and training program and tool availability package is being reviewed. Shops can look at their options for their business into the future, and can now have easier and often more legitimate ways of serving their customers. Although the cut-off date for reporting by collision repair and auto bodyshops of their auto refinish emissions was July 3, 2012, the City of Toronto is still accepting reports from shops. If the shop’s business does not generate a “threshold” level on these emissions then the shop must just report the emissions over the threshold. For many shops this means VOCs from painting and from solvent use must be reported. The current CHEMtrac reporting forms can be complex. For assistance in meeting this requirement of the City of Toronto jus call your CIIA association for help. We are using a simplified reporting structure for CHEMtrac that has been approved by them. Police and Licensing officers are starting to have an impact on tow truck chasing activities and anti-solicitation efforts are starting to work. In May of 2012, the City of Hamilton passed a by-law to license all tow vehicles. This by-law came just after criminal charges were laid against a “chaser” and two collision shops relative to active accident scene solicitation efforts and allegations that vehicles were damaged by the shop in order to increase an insurance company pay-out. Complaints form the public about accident scene solicitation prompted enforcement action. Hamilton already has an anti-solicitation by-law that prohibits persons from making representations at or near motor vehicle accidents. This anti-solicitation bylaw also applies to collision shop representatives that show up in cars and solicit at accidents. In the last five weeks, Hamilton Police have laid five charges against persons who were identified as soliciting at accident scenes. These charges must be addressed in the courts, rather than issue a simple ticket. have not done so to date. During the presentations on July 9-11, 2012 to the Ontario Standing Committee on Finance and Economic Affairs, the Committee heard from the Hon. Howard Pauley that: A 21-year-old male with a clean driving record living in Ontario would pay more than six times the rate that Manitoba insurance would cost, and in Alberta it would be 2.5 times what the province of Manitoba would charge. A 2010 Dodge Grand Caravan and a 35 year-old couple, both with 15-year clean driving records. In Toronto that insurance premium would be $3763, in Manitoba $1056 and in British Columbia it would be $1422. Please see the minutes of the Committee for further details on the Ontairo Legislature's web site. © 2012 www.ciia.com. All rights reserved.